Nice Blues mover by Bobby Paker. In the 50's he played for big stars like Otis Williams, Bo Diddley and Sam Cooke before he put out his first solo record 'Watch Your Step' in the early 1960's! Berry Gordy borrowed his first A-side, handed it to Marv Johnson, and produced a hit without crediting its originator as writer. The Beatles adapted one of his toughest riffs for the introductory hook of two major smashes. He's a prime inspiration to Robert Plant and Carlos Santana, and Jimmy Page tried to produce an LP on him. Yet Bobby Parker remains under the radar to all but hard-core electric blues aficionados. The diminutive Washington, D.C. axeman has no qualms about cranking his amp to 11, and he sings with the unbridled soul of a Little Willie John. Born in Lafayette, Louisiana on August 31, 1937, Bobby grew up in Los Angeles and got started young. "When I was a kid, there was a club there in L.A. called the Club Oasis," says Parker. "I must have been 14, 15 years old, on a bike. I came by there, and they had talent shows. I knew one good blues song, and that was 'Reconsider Baby,' that was Lowell Fulson's tune. I really did like that, man. I didn't even have a guitar. Pete Lewis was Johnny Otis' guitar player. He used to hand me his guitar and say, 'Man, go out there and do it again!' So I won the talent show six or eight weeks in a row, over and over again. It just began to inspire me." When Otis Williams & The Charms, a Cincinnati doo-wop group riding high on their hit Hearts Of Stone, needed a guitarist, teenaged Bobby heeded the call. "They saw me in this club," says Parker. "They needed a guitar player who could sing. They saw me, and asked me if I wanted to split, go out on the road, go out of town. My parents didn't like the idea, because I was in school. But L.A. was really rough, just like it is now. So I said, 'Hey, man. it's a chance to get the heck out of here!'" Bobby next joined Bo Diddley, backing Bo on his infamous appearance on Ed Sullivan's CBS-TV show in November of '55. "After Bo Diddley," says Parker. "I went with (baritone saxist) Paul 'Hucklebuck' Williams, the bandleader that was behind the band that was playing music for everybody goin' out from New York. Paul 'Hucklebuck' knew Vee-Jay people. Ewart Abner, that's who was in charge at that time. They wanted to know if I had some tunes, because I was singing tunes with Paul 'Hucklebuck' and playing guitar. So we came there and we recorded 'You Got What It Takes' and 'Blues Get Off My Shoulder.'" Cut in September of '57, Bobby's Vee-Jay debut sank without trace, but Marv Johnson scored a major 1959 hit with his Gordy-produced You Got What It Takes for United Artists—without crediting Parker's creation of the song. "I was a little fish swimming around in a big pond," he says. "It was hard to fight." Following his stint with 'Hucklebuck,' Parker made his home in D.C. "People here were just crazy with R&B music, so I decided to stay here," he says. 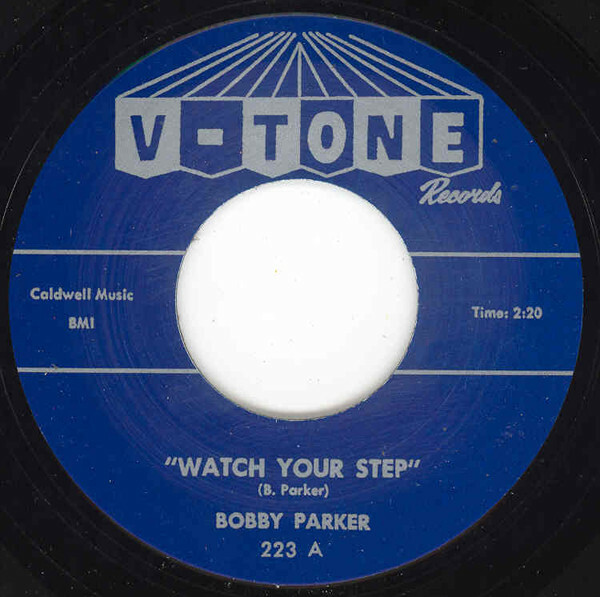 He wrote the rocking Watch Your Step and waxed it in 1961 for Venton 'Buddy' Caldwell's V-Tone imprint. Its piledriving guitar lick was cadged from an unexpected source. Lost opportunities are a watchword of Parker's career. He cut a '68 single for British producer Mike Vernon's Blue Horizon label, It's Hard But It's Fair, but the two couldn't get along well enough to continue. Bobby's chance to cut an LP for Jimmy Page in 1972 was also frittered away. Finally in 1993, Parker cut a fine (and very overdue) debut CD, 'Bent Out Of Shape,' for Black Top, encoring with 'Shine Me Up' in '95. He's still the boss of the D.C. blues circuit, brash and loud as ever. Customer evaluation for "Watch Your Step - Steal Your Heart Away 7inch, 45rpm"